The outstanding progress in immunology and the development of new technologies have resulted in the introduction of new immunotherapies, the so-called “immunomodulators”, for autoimmune diseases, inflammatory disorders, allograft rejection, and cancer. These immunomodulators comprise recombinant cytokines and specific blocking or depleting antibodies. Many of these therapies achieve their effect by stimulating the release of cytokines. The term cytokines includes interleukins (IL-), chemokines, growth factors, interferons (IFN), colony stimulating factors (CSF), and tumor necrosis factors (TNF). These molecules are involved in inflammation, cell proliferation and apoptosis, tissue injury and repair. These new therapeutic tools can be associated with side effects among which nephrotoxicity. The most common immunomodulators associated with nephrotoxicity are described in Table 1. 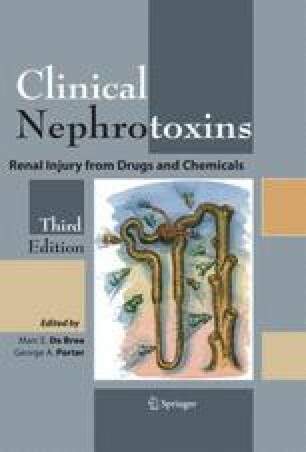 The nephrotoxic side effects of immunomodulators can be roughly divided into (ischemic) tubular necrosis, thrombotic microangiopathy, serum sickness, and autoimmune disorders.